As the year winds down, Jack O’ Lanterns are done greeting trick or treating juvenile posses, green leaves decide to join the carnival and burst into a riot of amber-hued pageantry, and Christmas shopping lists get longer… the fourth Thursday of November is before us and Thanksgiving is here. It may be a quintessential American tradition, but for me the significance is universal. Set aside one day in a year where all people regardless of race, color, creed, or social status, gather around for a feast with their family and friends and give thanks. What are YOU thankful about? I’m thankful for plenty of things. Among others, for my wife’s successful surgery; and speedy recovery; for our eldest son doing well in college and for choosing the right path in his proverbial “fork in the road of his academic life”; for our youngest son’s early acceptance at a prestigious college on the East Coast. I’m of course thankful for turning 50 with my sanity in tact; but most of all for the rare opportunity of having all my four parents (who flew in from afar), both sons (and my eldest’s girlfriend), and believed close friends by my side… helping me celebrate my half a century walking the earth and still acting like a 12 year old! I’m thankful for all my guardian angels for their incessant hard work and overtime (my brother-in-law always reminds me that mine do, and his are therefore working part time! ); I’m thankful for my parter-in-crime and best friend for never ceasing to teach me the values of compassion with her random act of kindness of helping friends and often practical strangers. I’m thankful for the big mouth, social skills, talents, and decent confidence I am blessed with in seeking new businesses and working with great clients who keep my solution searching and brand building skills in overdrive; I’m thankful for all the business partners, and colleagues who make all work possible. And of course I’m thankful to you, my dear readers, for welcoming me into your world, giving me the attention and the opportunity to share my experience and knowledge. And finally I thank God for giving me good health, an indescribable family, a sane mind, and steady fingers to type this message and keep all my blogs alive. 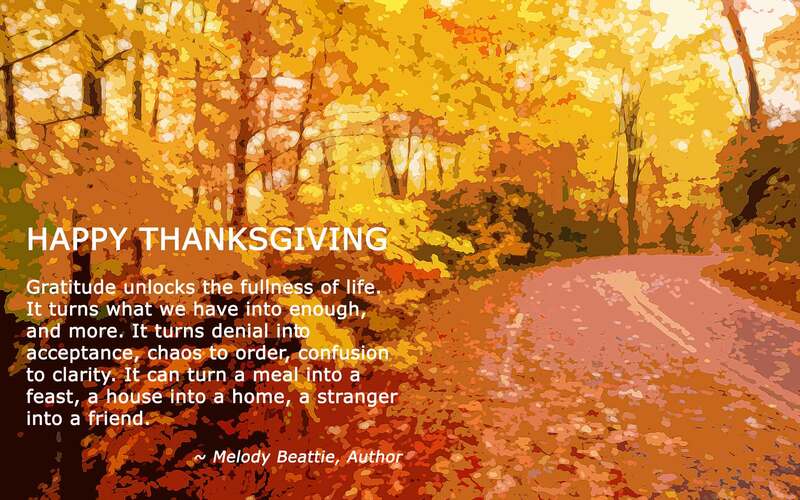 PS: I searched for Thanksgiving messages that had a decidedly modern design, and found the ones you see on this page. I particularly like Google’s Thanksgiving banner this year. This story was first published in Anthropelago Blog, where the author, Max Hasan, who was on a short stint in Jakarta, Indonesia, working with Habitat for Humanity, pondered the question of “what really defines poverty?“. I felt it was appropriate to share it here. At first, this claim struck and resonated with me. He seemed to be correct. If we take poverty as a relative term, then sure, there will always be a group of people who are perpetually “impoverished”—it all depends on context. However, after much thought and observation, I came to the conclusion that “poverty” is a static and concrete idea, rather than a relative and forever shifting definition. Yes, there can be those who are “poorer” or “less better off,” but poverty strictly describes “those who don’t have the means to attain the most basic human necessities.” Though this definition may seem vague and too far-reaching, that’s precisely what poverty itself is. Poverty is like a virus or a plague, as it exists, multiplies, and destroys. Furthering the similarities, it is preventable and can be uprooted indefinitely; it’s not something that has to exist. Throughout my travels in Indonesia, my conception of poverty, the poor, and who embodies these ideas has changed drastically. On Thursday, June 28, 2012, I embarked on several field surveys within Jakarta Greater Metro Area. These surveys were paramount to my changes in poverty perception. Below, are my notes and observations from the field. My colleagues invited me on a series of field surveys today. My eyes and heart were opened to the lives of these extremely simple and impoverished people who, despite having no material or financial assets, are still rich. They are rich in life, love, happiness—and all other aspects that truly matter in composing a wholesome and fulfilled life. Though only a couple of hours away from the smog-choked metropolis of Jakarta, these villagers were worlds apart from any city rat. 9:30 AM Cikangkung – Several homes and seven public water facilities were built by Habitat. In January, the area was ravaged by a flood with waters as high as 1.5 meters (5 feet). Homes and public water facilities were built as disaster relief products and thus donated pro bono. There were about 100 families living in the village, several of which had leprosy as a result of bad sanitation and irrigation. Prior to Habitat building these water facilities, villagers had to walk an absurd distance to use a brown, garbage-filled stream for all purposes (washing clothes, bathing, toilet, washing dishes, brushing teeth, etc.). Upon leaving the area we saw mostly naked village boys playing with what at first we thought was a squeaky doll, but upon closer observation, it turned out to be a live fruit bat, screeching and flailing while the village boys laughed hysterically. Santiago-based Architecture Firm AATA Arquitectos Asociados has a knack for bringing to life eco-friendly concepts with a modern twist. See my other post on their prefab green cubes in Easter Islasnd, the Morerava Eco Cabins. AATA has brought their design to the urban environment, for an exhibit at the Centro Cultural Palacio la Moneda in Santiago. This was to celebrate the artisanal craftsmanship heritage of the indigenous people of Chile. We hear about Ecotourism all the time, it’s the latest catchphrase that everyone around is using at the drop of a hat. But do we really know what it means? Responsible travel to natural areas which conserves the environment and improves the welfare of the local people. Environmental awareness and social responsibility has never been more chic and accessible. More than ever before, the world’s most renowned architects, designers, chefs and hoteliers are banding together to create a way of life that is both fashionable, yet treads lightly on the planet. EcoChic unearths the latest and most exciting developments the Green Movement has to offer, touching on gourmet eco cuisine, sustsainable fashion, eco architecture and green experiental travel, alongside daily improvements one can practice as part of an environmentally-friendly lifestyle. With ecological awareness fast becoming an integral aspect of our existence, EcoChic will be the quintessential guide to sophistication aspiring to live life both responsibly, and with style.